PushBullet (Android) - Push Anything to your Android! ~ Android Forever! 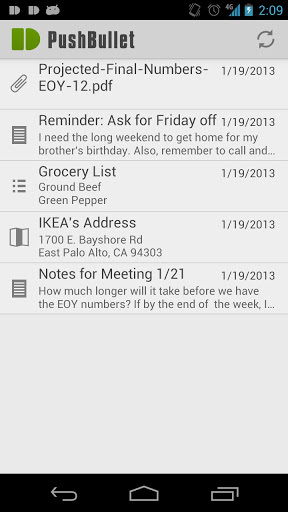 PushBullet (Android) - Push Anything to your Android! 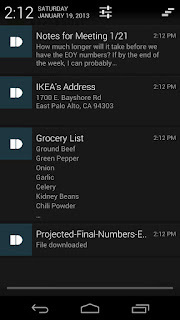 Developer Quote: "PushBullet makes it easy to push files, links, notes, lists, reminders, addresses, and more to your Android phones and tablets." Maybe you can't literally push anything, but lots of useful stuff, absolutely. 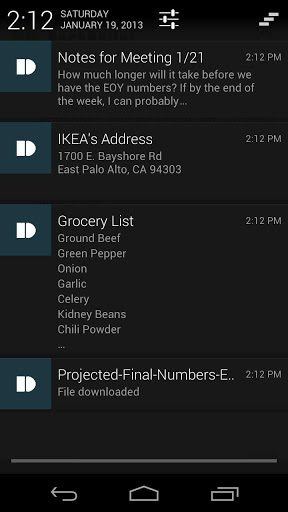 Want a file from you computer on your phone? Push it instead of hooking your phone up to your computer. Going grocery shopping? 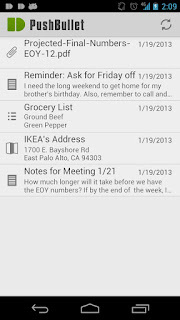 Push the grocery list to your phone instead of writing it on a piece of paper. Need to remember something important? Push it to your phone and it will be there when you need it.